This international conference brings together: analysis of the theory and practice of twentieth-century Marxist parties in relation to civil society; analysis of contemporary Left formations’ approaches to civil society; and analysis of the ‘idea of communism’ today and the relevance or obsolescence of ‘the party’ in the twenty-first century. Registration is now open for the ‘British Communism and Commitment’ day-school to be held between 9.45 and 4.45 on 9th June 2016 in the Labour History Archive and Study Centre at the People’s History Museum, Manchester. The day-school is part of the AHRC funded-project, ‘Wars of Position: Communism and Civil Society.’ It brings together former party activists and researchers from a wide range of academic disciplines to analyse the complexities of commitment in the British Communist Party over its seventy-year history (1920-1991). The day-school also marks the opening to researchers of new CPGB-related archive material, including the papers of Monty Johnstone (1928-2007). Registration is £20, which includes lunch. Places are limited. The closing date for registration is 31/5/16 (5pm). 3:30-4:45: Round-table: Communism, commitment and the archive. Chaired by Professor Kevin Morgan. Featuring Francis King (historian, former CP activist and archivist, editor of Socialist History), John Attfield (historian and former secretary of the Communist Party History Group) and Geoff Andrews (author of Endgames and New Times: The Final Years of British Communism 1964-1991 (2004) and The Shadow Man 2015), a biography of James Klugmann). 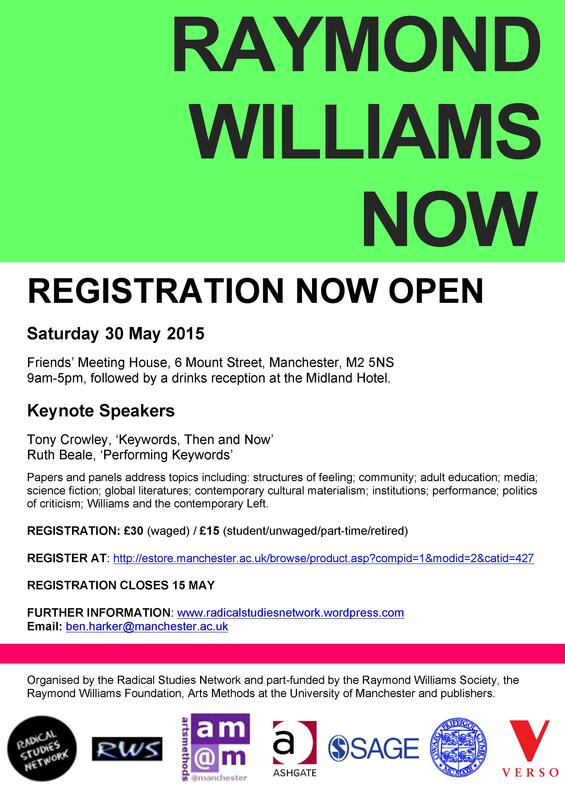 Registration is now open for Raymond Williams Now here until 15 May (£30 full, £15 concessions). The task of this presentation is to explore the feasibility of Rayomond Williams’ thought to critically understand digital labour. It presents parts of my 2015 book “Culture and economy in the age of social media” that is an application of Williams’ approach of cultural materialism to social media. I first point out foundations of cultural materialism and why it matters today. Second, I discuss the notion of cultural work and argue against narrow idealist notions that reduce cultural work to content production. Third, I discuss based on cultural materialism aspects of digital labour: I give attention to the international division of digital labour that is based on agricultural, industrial and informational labour and labour organised by different modes of production (including e.g. slavery, patriarchy, and capitalism) as well as to the notion of productive labour that is understood based on Marx and Williams in such a way that it does not separate advertising from commodity production, but sees it as an inherent part of it. Advertising is the key capital accumulation model of contemporary social media such as Facebook, Twitter, YouTube, or Weibo. Raymond Williams never wrote explicitly about ethics, though we might say that questions of value are in many respects the unspoken fourth dimension in his work as it criss-crosses back and forth between culture, language and politics. This paper foregrounds the ethical, but at the same time loops back to Williams’s trio of concerns, casting them in a new light. In Minima Moralia: Reflections from Damaged Life, Theodor Adorno writes: ‘Es gibt kein richtiges Leben im falschen’ (‘Wrong life cannot be lived rightly’). Whilst this statement should certainly be read as a piece of exaggerated late-Adornian rhetoric, designed to provoke contemplation of reality in ‘its estranged form’, it also leaves us with a pressing contemporary question: How does one lead a right life – a good life – in a wrong world? When thinking about this question the first set of problems we run up against are linguistic and political. On the one hand, ideas of the good life would appear to have been reduced to a set of consumer slogans embodying the superegoic injunction to ‘enjoy’ (‘just do it’. ‘because you’re worth it’, ‘live better’ and so on); on the other hand, the prevailing discourse of neoliberalism seems to all but preclude talk of the good life, presenting it as a kind of naïve and inefficient fantasy tied to a now outmoded economic and social form of life. In the present paper, I thus begin by looking at two different attempts to think through the good life, construed as both an individual and collective concern: first, Kant’s notion of the good which, in the Groundwork of the Metaphysics of Morals, he says consists in the good will doing its duty for duty’s sake; and second, contemporary late-capitalist duty, which entails a reconstruction of reason and various forms of working on the self. Demonstrating some of the philosophical, ethical and political limits of these approaches, as well as what might usefully be retrieved from them, I then move on to provide an alternative thesis. If we accept the premise of the original question – namely that the present world is a ‘wrong’ world — then perhaps our aim should not be to live a fully good life (conceived in the traditional or contemporary sense), or indeed to live a happy life, but rather to live a life which attempts to reclaim those ‘bad old things’ which the present now seeks to consign to the trashcan of history. Among these bad old things is, I want to claim, Kant’s Formula of Humanity: ‘Act in such a way that you treat humanity, whether in your own person or in the person of another, always at the same time as an end and never simply as a means.’ However, taken by itself Kant’s formula is overly formalistic and therefore vacuous. It thus needs to be supplemented by another (and perhaps more scandalous) bad old thing: namely, what I will here call militant political love. Scholars of modern African literature have often had to tackle the problem of how to locate texts that are written from an non-materialist perspective on the world. Given that animist cultures (which vary greatly, but can broadly be described as involving a worldview in which material objects have a spiritual essence) persist on the African continent, any materialist perspective on African literature must take into account the differing valence of the ‘material’. In an influential article Harry Garuba (2001) coins the term ‘animist materialism’ and advocates a mode of reading which takes animism into account. However, despite the similarity of his terminology, Garuba’s approach is far from a cultural materialist one — indeed, it tends towards a celebration of the animist worldview that obscures the role of other material forces in literary production, thus making it hard to establish the specificity of the interaction between the ‘animist unconscious’ and literary form. This paper argues for a return to Williams in African literary studies. Despite the common critique of eurocentrism, Williams’s writings on the materialist method do not define the material world in a way that precludes sensitivity to an animist worldview. Rather, I suggest, Williams’s discussion of the potential pitfalls of materialism, his understanding of the role of nature in literature, and his sketching of the dynamics of dominant, emergent and residual cultures all demonstrate the kind of openness to the non-material and its potential interaction with modern capitalism that can be highly productive for African literary studies. Furthermore, I argue that the return to Williams is also a politically expedient move for African Literary studies at this juncture. This paper shall focus on Williams as a cultural theoretician in the stricter sense. On the one hand, I will discuss his role as a precursor and pioneer of Cultural Studies (which means concentrating on the relevant writings from the 1950s and early 1960s), while on the other hand looking more closely at his concept of ‘cultural materialism’ (developed above all in publications of the 1970s). Several studies (e.g. Milner, Jones) have divined a continuity in Williams’s work on the concept of culture that they consider more or less unbroken, and interpret as ‘Marxist’. In contrast, although I agree with this interpretation of Raymond Williams’s basic stance, I will take as my point of departure the idea that his approach to and methods of theorising underwent several shifts in the late 1960s/early 1970s, conditioned by the changing political context and the growing importance of ‘European’ thinkers. In the early 1970s Williams held the Lukacs of History and Class Consciousness, alongside Antonio Gramsci and the Sartre of the 1950s and 60s, to be the most important representative of an ‘alternative Marxist’ tradition. This paper will reconsider Raymond Williams’s essay, ‘The Bloomsbury Fraction’ in Problems in Materialism and Culture in relation to the ‘free theatre’ movement in London inspired by Ibsen, the New Woman and the ‘play of ideas’ and leading to women’s suffrage theatre and the little theatre movement. The members-only theatre societies played an important role in promoting debate about politics as well as engaging in political activism by staging plays that were effectively censored and gathering together audiences with shared values. In the period from 1891, when J. T. Grein’s Independent Theatre Society produced Ibsen’s Ghosts, to 1919, when the British Drama League was founded to promote amateur theatre nationwide, the theatre societies occupied an ambiguous position. Often developing from cultural formations, they became institutions. This paper will examine the problems this raised and the ambiguous relationships this generated between theatrical entrepreneurs, dramatists, translators, actors, audiences, patrons, theatre managers and reviewers. The costs of the ‘free theatre’ movement often fell invisibly on those who could least afford it, although the wealthy were the widely publicized patrons under whose auspices such experiments in drama were encouraged to flourish. If performance exists in the borders of modernism, then particular performance traditions reside in what Raymond Williams terms the ‘wide margins of history’, spaces overshadowed by dominant cultural narratives and agenda. This paper focuses on a collection of performance interventions from the British Workers’ Theatre Movement, events and happenings often overlooked even in narratives of modernist performance. Williams’ own admiration for these performances in Politics of Modernism: against the new conformists provides a way in to the discussion. Understanding these varied performances (namely Meerut, The First of May and Their Theatre and Our’s amongst others) as, borrowing Williams’ term, ‘emergent’ despite their age enables us to resurrect them from the margins and discover what they have to say about context and how they might engender new performances in the future. These performance events do not simply reside on theoretical and generic borders but, in fact, investigate the border as a theatrical concept both scripturally (scripts constantly promote an overcoming of national borders in favour of transnational solidarity) and spatially, sets and performance spaces set up to consider, challenge, overcome or celebrate the border. Adapting and augmenting Williams’ concept of the border enables a rereading of modernist performance and, particularly, performances often disregarded by the canon. It also initiates a re-examination of these performances as important artistic responses to the shifting, troublesome borders (in terms of class and nation) of the 1930s. This paper will explore the ideas associated with the field of Performance Studies as it came to be understood during the 1980s and 90s. Richard Schechner posited performance as a ‘broad spectrum’ of human behaviours that are relational and self-conscious, and that are ‘framed, presented, highlighted, or displayed’. This definition provided the foundation for a newly formed field entailing theatre, everyday life, ceremony and ritual, sport, and many other cultural practices. Although Raymond Williams died before these ideas circulated widely across the Atlantic, as early as his inaugural lecture as Cambridge Professor of Drama (1975), Williams demonstrated that his own thinking was moving along compatible lines. In ‘Drama in a Dramatized Society’, he writes: ‘I have learned something from analyzing drama which seemed to me effective not only as a way of seeing certain aspects of society but as a way of getting through to some of the fundamental conventions which we group as society itself’. This is the germ of the possible linkage of Williams’ sociology of culture to the nascent form of ‘performance studies’. I will explore some of the affinities and tensions between William’s work and what has come to be Performance Studies. This paper will attempt to define the ‘radical archive’ as distinct from other forms, especially from its close relative in the ‘community archive’. It takes the Working Class Movement Library in Salford as an example of a radical archive that is also a community archive, but which is also qualitatively different from other community archives in its radical ambitions. Recent literature on the concept of the ‘community archive’ provides us with a necessarily broad (sometimes irreconcilable) set of indicators, and uses the WCML as an example. It becomes clear, however, when thinking about the library and archive established by two activists (Ruth and Eddie Frow), that while a community archive may also be a radical one, this is not necessarily the case. Working-class community, as people like the Frows conceived it, had a local manifestation but was also international in scope; ‘community’, here, means something like ‘solidarity’. The Frows’ hopes for the WCML and its significance also had hegemonic and unashamedly teleological ambitions, which is not true of all community archives, even of all radical ones. Raymond Williams’ insights in various published works help us to think through such distinctions. They also help us to affirm the past victories and future potential of radicalism in what Williams called the ‘Long Revolution’, in a period and context in which there is no obvious class agent of emancipation or focus of struggle. ‘Community’, as Williams warned us repeatedly, is a curious political term in that everyone lays claim to it and no one presents themselves as being ‘anti’ community as such. To insist on the ‘radical’ aspect of ‘community’ is to embrace opposition as a necessary and fertile aspect of its structure of feeling. When Williams worked for fifteen years full-time in Adult Education, he could still see the ‘adult education movement’ as an important agent in ‘the long revolution’. A reviewer of the book (1961), however, headed his critique: ‘The Optimistic Revolution’. Raymond’s prescience was a major strength and this gave him self-critical awareness that The Long Revolution (with his concurrent adult education trajectory) was narrowly English. Engagement with dramatic global changes from the late 1960s led to his ‘Welsh European’ perspective so that in Towards 2000 (1983) he was able to predict the dystopian challenge which ‘Plan X’ (neo-liberalism) presented and which we now know has all but destroyed adult education (along with so much of ‘The Spirit of 1945’ welfare states). building upon earlier political and social movements and spawning a wide range of educational activities, many informal, sharing ‘the practice that requires the distinction between active teacher and passive student to be broken down’ (Williams and Freire). These, often using the ‘new interactive technologies…from people’s own homes (to achieve) full social and cultural powers by civil society, as opposed to their marginalisation by the corporations and the state’ (RW, 1983). We will sign-post ways forward from RWF’s residential education experience, developing stronger links with the OU/oD ‘Participation Now’ initiative, helping create that ‘educated and participating democracy’ which was Raymond’s lifelong aim. 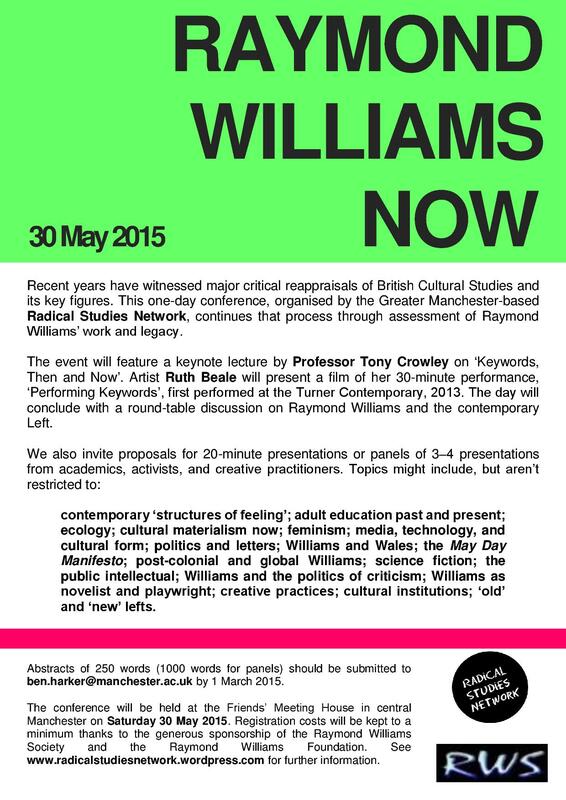 We’re pleased to share the call for papers for our conference on Raymond Williams in May. The conference organisers are Jen Morgan, Elinor Taylor, Ben Harker and Kristin Ewins. Enquiries can be directed to ben.harker@manchester.ac.uk, or to radicalstudiesnetwork@gmail.com. We’re looking forward to reading proposals and organising a really productive day. I was a teenage Hefner fan and am looking forward to the release of singer Darren Hayman’s new project: setting the lyrics of William Morris’ pamphlet ‘Chants for Socialists’ to music. The clip above shows how enmeshed this album is with Morris’ legacy: recording vocals at Kelmscott House and Kelmscott Manor, using Morris’ letterpress to print LP sleeves, and recording Morris’ piano at Kelmscott Manor. I saw these as ‘emergency’ protest songs, something to draw on in times of strife. I think we are in troubled times. I regard these as useful lyrics. Morris grouped these songs under a banner of socialism and I class myself as a socialist, but these songs, to me, are more about simple kindness and hope. I acknowledge the naivety and rhetoric in these words. They offer few practical solutions for today, but I love their simplicity. They make me feel young again. They remind of the hope I had in the Red Wedge movement, and how politicised I was around the 1984 miner’s strike. He also invited local singers from Walthamstow to contribute vocals.